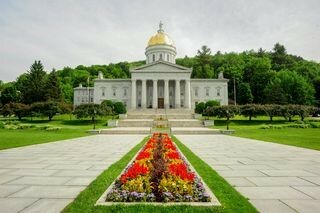 Vermont's historic Statehouse is a veritable museum, and one of the state's most popular tourist attractions. But you no longer have to trek to Montpelier to see it — thanks to Google Street View, you can take a highly detailed tour online. Google held a press conference at the Statehouse today to launch its tour of the Capitol — one of 1000 iconic locations worldwide that Google Maps added today to its virtual collection. In addition to the Statehouse, Street View's high-resolution, panoramic images make it possible to “visit” places such as a zoo in Singapore and the peaceful canals in Copenhagen, Denmark. "Google’s mission is to make the world's information accessible to everyone," said Matt Dunne, Google’s Head of Community Affairs. Dunne was joined by Statehouse curator David Schutz, Senate President Pro Tem John Campbell (D-Windsor) and representatives from the Agency of Commerce and Community Development. Dunne, a former state representative and state senator, is intimately familiar with the Statehouse. He spoke before the unveiling of the tour of his former workplace, which is the first state capitol to have its interior photographed by Google Maps.